Make your reports easy to page through and appreciate with this Avery Lay Flat Report Cover. 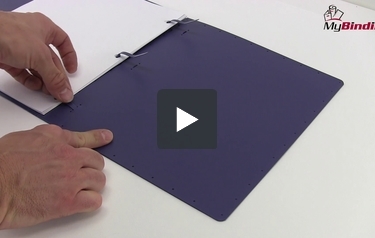 Three sturdy plastic loops thread through the punched holes in your pages to secure your report inside the cover. The cover opens flat, and the loops enable your pages to lay flat as well for easy reading and turning. A translucent window on the front cover holds your customized title page for a report that impresses from the first glance. Predesigned Avery templates and software provide easy customization of title pages. Available in black or blue. Five Stars Review by J.M. new throught and you can reuse them w/o them ever looking worn. Spine is thick enough to put a lable on it. Outside presentation window is the full length of the folder so you can slide a regular size sheet of paper. Holds more sheets than it says. Great for school work, recipe collections or any other project. If ultra organziation is your thing or you just need a good sturdy folder for long term use w/o having to replace it, this is for you. Only con is, you do need a 3-hole puncher if you are using other than loose leaf paper in it. Very proffessional choice for the price range. Lastly you can expand it's organization usablity by using dividers. I use this report cover at all times. I love it. I work in Healthcare and have so many employees that I need to put things together for. This is perfect-you can put a nice cover sheet in the front and then add as many sheets as you would like. I always use sheet protectors in mine, but you don't have to. Folks are usually impressed with how nice they look. They are very durable as well and can take some abuse. I only wish it were easier to add a sheet of paper. It is easy to just add it to the end-no problem..but the way that I have them is in a particular order and if I need to add one in the middle-you have to pretty much take the whole thing out and put it back in. Other than that though...I recommend them highly. Like I said-I use these alot!! Enjoy!